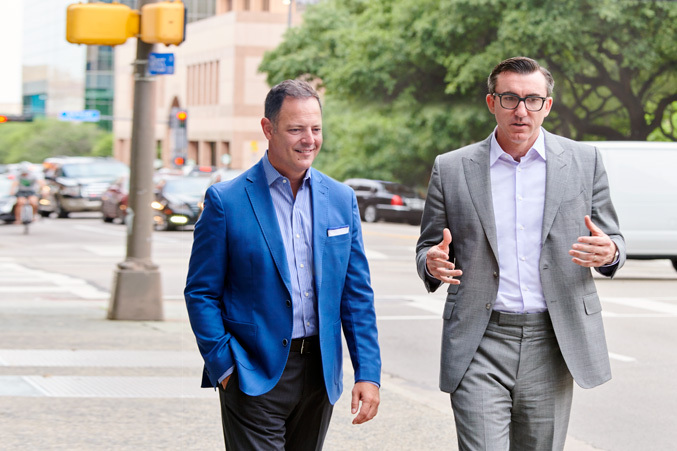 How Dan Healy and Rafael Anchia built Civitas—by finding great investments that improved Dallas communities. There was no money. It was late 2008, the height of the U.S. financial crisis, and global investment banks—Bear Stearns, Lehman Brothers—were failing, vanishing overnight. This was the backdrop for the coffee sessions between Daniel J. Healy and Rafael Anchia. They would meet before work—Healy’s job was at a traditional investment firm that was staring into the crisis’s abyss; Anchia’s was at law firm Haynes and Boone, where he heard about real estate clients’ pain every day. After the gallows humor subsided, the pair would explore possible answers to a simple question: Is there opportunity in this crisis? Healy and Anchia disagreed with the naysayers. Healy argued there was a path to build a new kind of firm, one that would dig deeper to find opportunities others miss. A firm that could make money for investors and still help the communities in which those investments took root. Healy believed this for one really good reason: His mother told him so. “My mom is an immigration lawyer,” Healy says. “She said, ‘You guys should look at EB-5.’” She stressed that EB-5, a long-lumbering government visa program that offers U.S. residency to foreign nationals who made job-creating investments in distressed or rural communities, was at its heart an excellent vehicle for people to realize the American Dream. But the EB-5 industry largely lacked the professionalism of the sort they could bring. Healy and Anchia realized such a firm could serve the cause-oriented approach they both desired: make smart, creative, catalytic investments in undercapitalized areas, thereby making money for investors and helping communities prosper. Plaza, which Civitas purchased with Korean investors in 2016. The staff went from four friends in 2008 to 55 employees who collectively hail from 18 countries and speak 17 languages. Civitas’ 1,200-plus investor base now spans more than 30 countries, and the firm’s investments now range from California to New York City. Using the same principles that built the firm’s brand in EB-5 investments, Civitas Capital Group expanded its investor base from individuals to family offices and institutions also seeking investments in the areas Civitas operates: lodging, multifamily, senior-assisted living, and even alternative credit. Examples abound. The investment Civitas made in NYLO Dallas South Side looks like a home run today, as the Cedars continues its remarkable revitalization. At the time, though, a full-service hotel had not been built south of I-30 in Dallas proper since World War II—much less a high-end boutique hotel. Now, NYLO has been a success for both investors and young urbanites, its rooftop deck and pool offering one of the most impressive views of downtown one can find. (See the advertisement on the inside front cover of this magazine for proof.) Along with the Dallas Police Department headquarters down the street, it served to help stabilize the area for further investment (e.g., the Alamo Drafthouse just to its north). North Oak Cliff, perhaps the city’s greatest urban neighborhood success story, also was not a sure bet when Civitas eyed its first investment there—certainly not outside of Bishop Arts, which was just then starting to take off. In the Zang Triangle adjacent Lake Cliff Park, across from Methodist Dallas Medical Center, Civitas saw an opportunity to set the market in North Oak Cliff, using an oddly shaped multifamily property to do so. “There hadn’t been new multifamily housing in the area in decades,” Healy says. Zang Triangle served as the seed crystal that proved the area was ready for greater density. Today, it’s on the Dallas streetcar line that connects Oak Cliff to downtown, a hub for development activity around it. What hasn’t changed is Civitas’ overarching strategy, first drawn on napkins a decade ago in that now-bulldozed Dallas coffee shop. The idea was always to build its EB-5 brand and attract investors overseas. For Civitas, “cultural competency” means more than hiring a few Mandarin speakers to make sure investors use the correct wiring instructions for their money. Cultural competency is a core value, a key driver of the firm’s competitive advantage. In the beginning, it meant hiring and training a diverse staff of professionals who truly care about understanding international clients’ needs at a deeply personal level, because EB-5 investment is a life-changing experience, not merely a financial product. Civitas worked hard to instill cultural competency at the firm level, to the point that individual EB-5 investors in China, Korea, and Latin America feel like they are investing down the street. To the outside eye, the common thread in these approaches may not be apparent. To Healy and his team, it’s clear. Fill out the “Contact Us” form below for more information on EB-5. Someone from our team will be in touch soon to answer your questions!